I will be the first person to admit that in the past couple of months, I fell off of the cereal train. I did. Don’t get me wrong…I absolutely love cereal…but I was just in a rut and really just needed something different in the morning. I went to fruit and yogurt and enjoyed it well enough and was content with it. Until I went to the Gluten Free Food Allergy Fest in Indianapolis, Indiana back on October 24, 2015. My mom, also a Celiac, came up from Birmingham, Alabama, with my dad and we all went together to scope out the expo. Trust me, I do this event every year that it has been in Indianapolis…and I love it. Freebies, samples, and local products/businesses all come out and reel me in. I won’t lie…I walk out of there broke…but it’s worth it in the end. I have never regretted a moment. Now, one of the booths I have started to look for each year belongs to Freedom Foods. Why? Well…I’m getting to that. Freedom Foods makes a variety of products, although only a few items are available in the United States at the moment…and most of these include cereals, which, for the record, are made in a dedicated and specially built allergen-free facility in the Riverina region of New South Wales, in Australia. As Freedom Foods was specifically developed to make allergen-free foods, they test every batch made in their facilities, to the most stringent levels possible, leaving no doubt that the Freedom Foods products you pick up will be free of the allergens that are necessary to avoid. One of my favorite products, mind you, is the Tropico’s cereal, which is a gluten-free version of Froot Loops, but made without artificial colors, ingredients, partially hydrogenated crap…you know…all that bad stuff that Kellogg’s puts into their cereals and people consume freely. I am a cereal girl. I start most of my mornings with a small bowl. A serving. And yes…I do measure. You knew that already though, right? So, imagine how my mind was blown when I found the booth at the GFFAF and saw that they had a new fruity cereal out. Like…brand new this year. It’s the Freedom Foods Fruity Rainbow Rocks (think Fruity Pebbles). They gave me a little cup to sample and it won me over wholeheartedly. It was like…little flakes of everything I love about Tropico’s. Well, I might even prefer them to the Tropico’s…which, naturally would happen, since I haven’t seen the Freedom Foods Fruity Rainbow Rocks anywhere outside of the GFFAF that day. I purchased two boxes. I should have bought them out, HA! I almost didn’t want to pop open a box so soon, but with the cereal that brought me back into cereal now completely consumed (that would be the Trader Joe’s Gluten Free Pumpkin O’s, for the record), I needed something else this morning. Yes…this very morning. Before heading to the gym for my 5:30 a.m. spin class…I needed some fuel. And with two boxes staring at me from the pantry…I grabbed one and tore it open, measuring out a serving (1 cup), topping it with some unsweetened cashew milk, and then devouring it while standing right there at the counter in my kitchen. It really is that amazing and that good. This cereal is everything all rolled up into one healthier package than average regular and gluten-free cereals out on the market. And, because of the fruity flavors, I don’t feel like I’m missing out on my cut fruit and yogurt. Honestly, this cereal amazed me. The little flakes of fruity goodness get a little soft in the milk, but it only helps to emphasize the flavor. And, when your cereal is made with real ingredients, not fillers and artificial bad stuff, well, I give it a pass on how long it swims around in a pool of cashew milk before getting soft. It didn’t bother me, as I was standing in my cycling clothes, hunched over my Eeyore cereal bowl, just shoveling this stuff into my face. Food is fuel. Real food is the best kind of fuel. If you like fruity cereals…low in sugar…big in flavor, then Freedom Foods Fruity Rainbow Rocks is the cereal for you. Who knows, you might even find yourself hunched over a bowl in your kitchen. Let’s talk about what goes into Freedom Foods Fruity Rainbow Rocks, shall we? This cereal is made from a gluten free flour mix (rice flour, yellow corn flour), sugar, resistant dextrin, psyllium husk, paprika oleoresin color, carrot oil color, sweet potato color, turmeric oleoresin color, tricalcium phosphate, salt, sunflower lecithin, and natural flavor. It is free from gluten, nuts, wheat, dairy, eggs, soy and sesame. Freedom Foods believes that the less salt you eat, the healthier you are, so they only put in a pinch of salt in this cereal. This cereal also contains a natural, grain-based prebiotic that help to nourish the good bacteria in our digestive tracts which…helps with good digestion and overall health. This is a simple cereal that is doing really amazing and big things for your body and your health. And that’s why I love this brand so much! As for nutritional information, hold onto your gluten-free knickers, my friends. Freedom Foods Fruity Rainbow Rocks is a healthier take on cereal, and that’s evident in the nutritional facts. 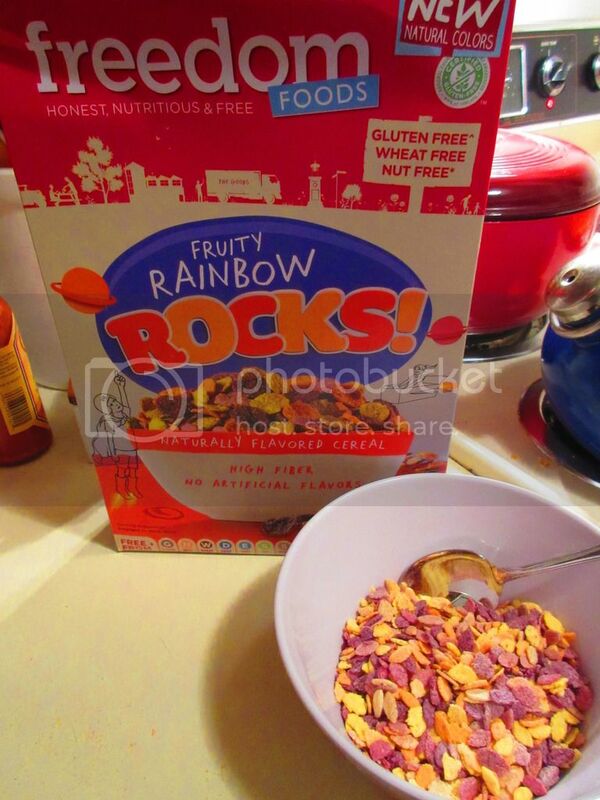 A serving of Freedom Foods Fruity Rainbow Rocks is 1 cup. This serving will give you 180 calories, 1 gram fat, 0 gram saturated fat, 0 grams trans fat, 0 mg cholesterol, 75 mg sodium, 36 grams carbohydrates, 5 grams fiber, 7 grams sugars, and 3 grams protein. For being little flakes of fruit flavor, these can actually feel and be quite filling thanks to that fiber and protein. Fruity Pebbles has 0 grams of fiber and 1 gram of protein, if that tells you anything. What a difference real ingredients and no artificial…anything makes! There is a lot to love about Freedom Foods. They set a high standard for themselves and aim to create delicious food that is free from the “stuff” that your body doesn’t need— gluten, nuts, wheat, dairy, eggs, fructose, soy, yeast, GMO’s, and artificial flavors. Here you have a truly allergy friendly cereal. YAY! Not only this, but all the products from Freedom Foods focus not only on allergen-free safety, but, better nutrition and taste. They use clean and recognizable ingredients so you won’t feel guilty noshing on a serving. Come on, what’s not to love. So, whether you are a kid at heart or just love fun cereals in the morning, I encourage you to seek out, or even order, Freedom Foods. Your body will thank you for it! This entry was posted in Breakfast, Cereal, Clean Eating, Expo, Food, Fruit, Gluten-Free, Products, Review, Sweet Stuff, Vegan, Vegetarian, Yogurt by The Celiathlete. Bookmark the permalink.